This post is a tad late in the telling, but I’m catching up with all my back stuff this week, and wanted to have these notes on the record. Retrogrouch and I were happy to have the opportunity to spend the weekend in continuing education at the Northwest Food and Wine Festival, courtesy of festival sponsor Buick, a couple of weeks ago. Thought I’d check out the PDX food scene in one fell swoop, ha! Here are some of my impressions on the festival, a collection of 50 restaurants and food vendors, plus hundreds of wines to taste. Urban Farmer, a “modern steakhouse” that really is all about the steak, had the nicest spread, offering two bites: a delicious shellfish mousse cube topped by honsui Asian pear, sorrel, and lemon zest purée and a crunchy, crackly pork chicharrón on top, and the one pictured here, a too-large corn cake topped with some type of pork pâté, peach preserves, and chili aïoli. The carrots upon which the corn cakes are resting, and several other examples of the restaurants preserved products, looked delicious, but I can’t help but wonder if they are safe, being pickled in such large jars. Maybe there are commercial versions of our home canned recipes. 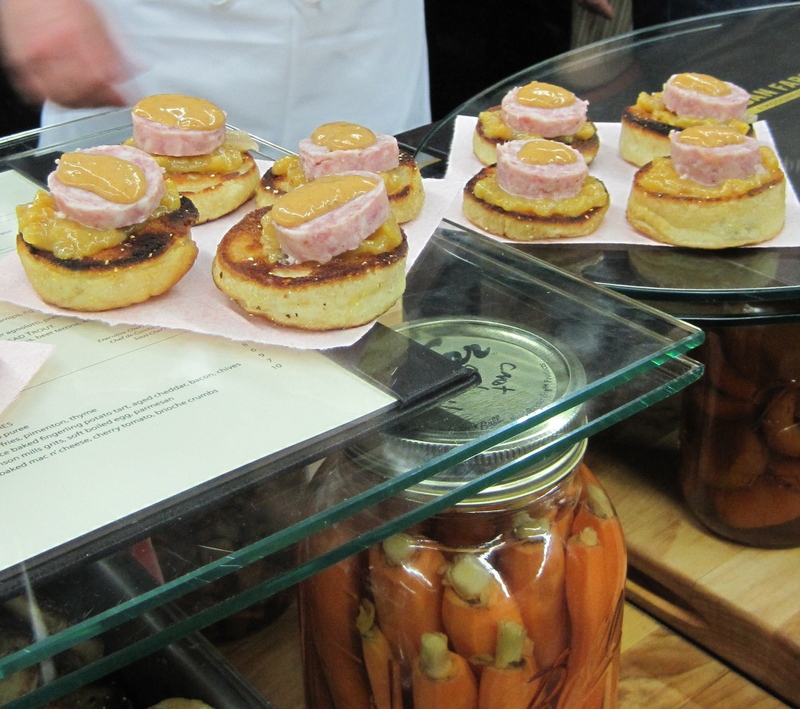 Brioche sliders made with pork sausage, also from Toast. The server explained that at the restaurant, they are served with scrambled egg and hollandaise. Salmon showed up in a tartare with yuzu and togarashi (delicious) from H5O Bistro Bar, and a “Portland-style” miniature hot dog from The Original, a so-called dinerant. 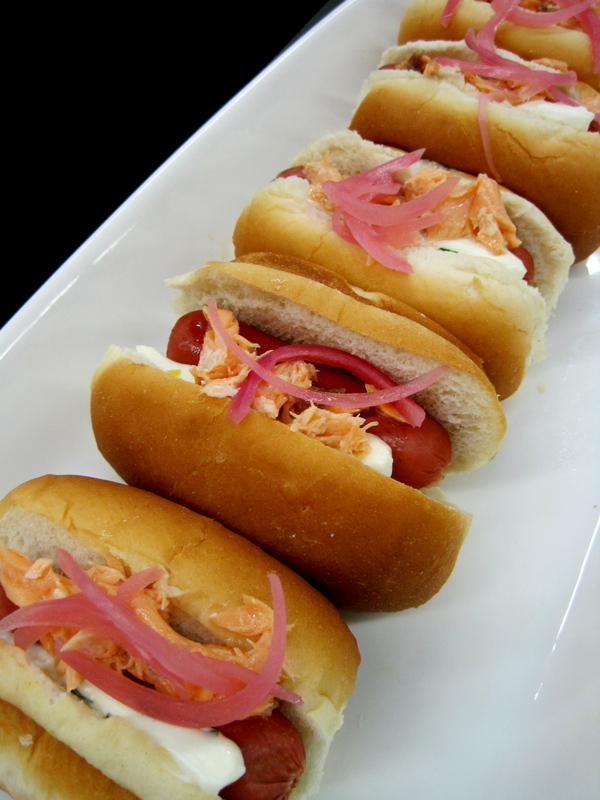 The hot dog was topped with smoked salmon, pickled onions and peppers, and flavored sour cream. I’m not sure PDX has ever seen a hotdog like that (or wants to), but it was a cute interpretation next to the Chicago Dog, complete with green-dyed onions, jalapeños, mustard and peppers, and a Coney Island dog with chili and cheese. Too much whimsy = pretentious by calling it a “hot dog flight,” though? A delicious curried lump (aka dahi wada) from Plainfields, which is a wonderful place to enjoy a meal. I was happy to see the owner there. The pork pâté parade continued all through the festival, becoming a bit tiresome by the end. The Heathman brought out one with sultana marmalade and a pickle. It was fine, but by that time I was getting a little tired of the spam-jam combo. But I still had room for Davis Street Tavern‘s taleggio topped with fig jam and a marcona almond. Yum. Their butternut squash soup, for the record, was more savory and cheesy than the other butternut squash soup down the line. Davis Street’s also had a yummy cilantro crème on top. More of the same -ish, but representing more preservation trends that get my full approval, Wildwood Restaurant had baked up some home cured pork tongue over sauerkraut, served on teeny rye bread slices. Date syrup, tasting like a cross between a molasses and agave syrup. I’m not sure about any health claims they’re making on the site, but it was tasty. Pork was the real star (the festival featured not one but TWO pig heads from Sweet Briar Farms), but beef appeared in many stewed forms, and a few plain grilled chunk forms. Cattail Creek Lamb stew made of shoulder (I think) and served over brothy white beans. Lovely. The Cattail folks weren’t particularly interested in talking to me, though — always awkward when you’re the only person standing there — so I didn’t ask more questions about their outfit in Junction City. A shame, really. Hama Hama oysters were excellent with a mignonette sauce. An ash-coated Mt. Townsend Creamery cheese called Seastack rocked my world. Less rarified but still not bad was the new black label Cambozola cheese, soon to be at an upscale grocery near you. The Cambozola was part of a display of many deli products being distributed by a big vendor, next to a similar distributor hawking fresh fruits and vegetables. Note to fruits: you probably don’t want to bring out of season California strawberries, raspberries, and blueberries to an Oregon food event. Just sayin’. The Oregon Dungeness Crab Commission was there serving pure, unseasoned chunks of crab. Yes, just plain crab. And it was better than anything at the festival. Oh yes, and a taste of subtle, creamy bacon maple ice cream from Fifty Licks for dessert. I would have chosen the scotch flavor, but they didn’t have that one at the festival. FIfty Licks doesn’t have a website, but look for them at events around town! As for the wine part of the festival, I am a bit sad to say I’m not drinking these days, so the wine tastings were largely lost on me. But I did succumb to the charms of the German rieslings being poured by Portland wine distributor Ewald Moseler, tiny tastes of the pepper vodka and the gin at BendDistillery, a few new vintages from South Willamette Valley pinot noirs and rieslings, and, well, a half glass of Stella Artois. All in all, it was fun and I learned quite a bit about dining trends in the big city. I think the chopped organ meat trend has just about run its course, though, boys. Maybe others disagree, but I, for one, am ready for something new on the scene. We certainly had local items within the T-day meal, including the cranberries in the cranberry sauce; the pumpkins in the pie; the bacon, shallots, celery, butter and hazelnuts in the stuffing (and the bread was local, but probably made from flour from out of state)…but the whole meal wasn’t local. The turkey was a Shelton, from Southern California. I’m not sure why our local fancy grocery and the local meat market both opt for Shelton’s fresh turkeys, but they do. We don’t likely have a big local supplier. As I was doing what I could with the leftovers, an endeavor that inspired me to transform my turkey breast leftovers via Fuchsia Dunlop’s Sichuan strange-flavored chicken salad, it occured to me that I could make a simple, nourishing, light soup from the corn instead of eating it and pretending it was Chinese. 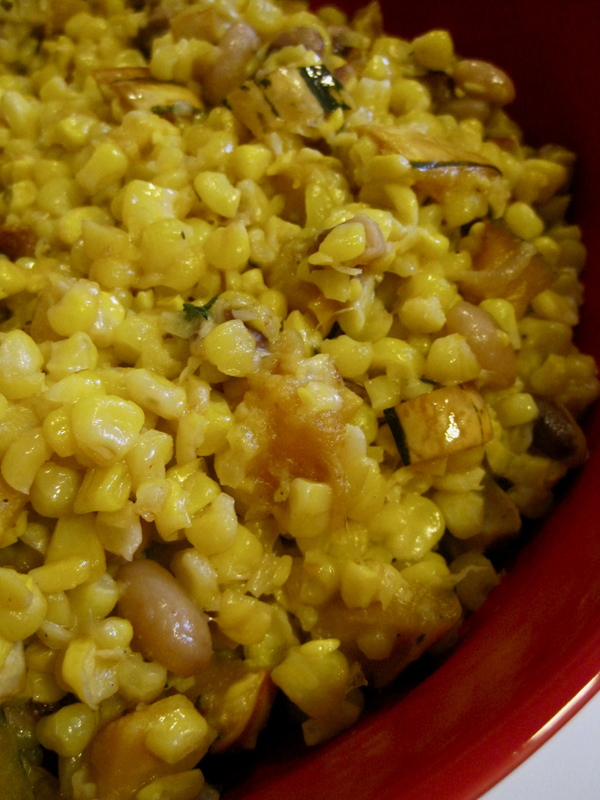 The corn dish I created this year was based on the proverbial “three sisters,” corn, beans and squash that were so-named because they serve as perfect companion plants in the fields. The corn provides a pole for the beans, and the large leaves of the squash plant shade and protect the roots of the corn and beans until late in the season. Everyone knows the old culinary saw, “if it grows together, it goes together.” Why not use my dried beans, frozen summer corn, and fresh storage squash together? The Thanksgiving corn side dish featured cream, thyme, roasted squash, and yellow-eye beans sautéed in butter the night before. I had planned to use Anthony Boutard’s tarbais beans (Gaston, Oregon), since they hold up well, but I had just enough yellow-eye beans left (non-local, but I bought them in San Francisco, where they were local) from last season to add a sprinkle of beans to the dish. The local corn itself was not the sweet, locally celebrated Bodacious, but rather a more corn-y, chewier variety that makes for a disappointing ear mid-summer, but a deeper, toastier taste when used frozen in winter recipes. The delicata squash was what it was: fresh, delicious, and easy to roast and cut into small pieces with the skin on for more fiber and pretty stripes. 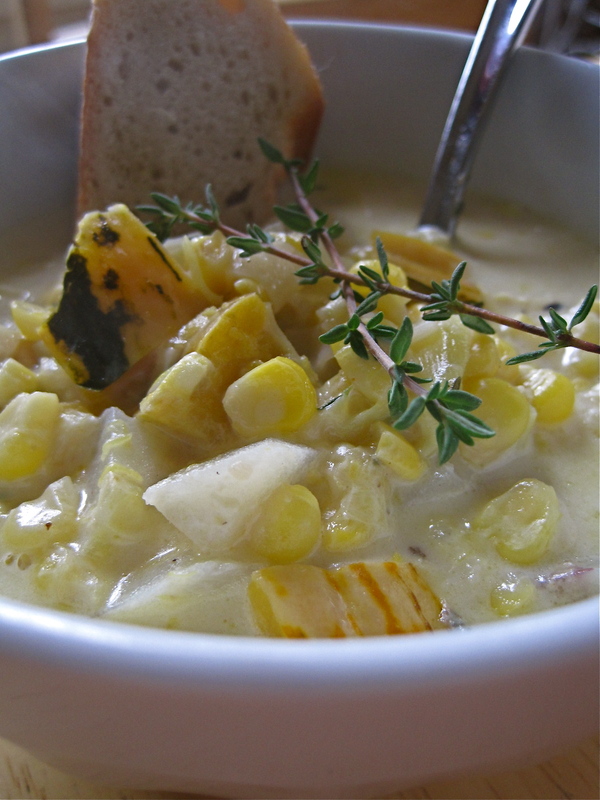 With leftover buttery, creamy corn already seasoned with thyme and studded with squash and beans, I thought I might capitalize on a good thing and turn a local side dish into a local chowder that was hearty enough for dinner, yet light enough for dinner after Thanksgiving. I added enough Noris Dairy milk to cover the corn and fill a small pot, then cut up a good knob of local leek and a local red-skinned potato. A quick trip out the garden yielded even more thyme. A healthy grind of black pepper and a good dose of salt finished it off. I simply simmered the soup until the potatoes and leeks were soft. Served with leftover baguette from a local bakery, it was perfect for a postprandial repast. You could make this chowder with fresh ingredients. Sweet, milky corn freshly shaven off the cob and poached in butter and milk with new potatoes and summer squash would be absolutely divine. But it wasn’t bad for a fall dish, not bad at all! Bring it on, challengers. Bring. It. On. We had 21 people over for what could be called an “orchestrated potluck” this year on a rainy, cold evening. My dear friends brought appetizers, side dishes, and desserts to supplement what I had made, and thus we had a wide range of choices for all the guests. We had several vegetarians and one non-dairy guest, and a range of tastes from traditionalist to foodie, so I am so very pleased we were able to accommodate them all. I’ve been sick, with laryngitis most of the week, and under the pressure of several deadlines, so the potluck option really saved me from peril. Plus, I liked seeing the family specialties that people contributed, and I like to think that they enjoyed being a part of the preparation. Everything was delicious; honestly, not a single dish misfired. OK, let’s talk turkey. 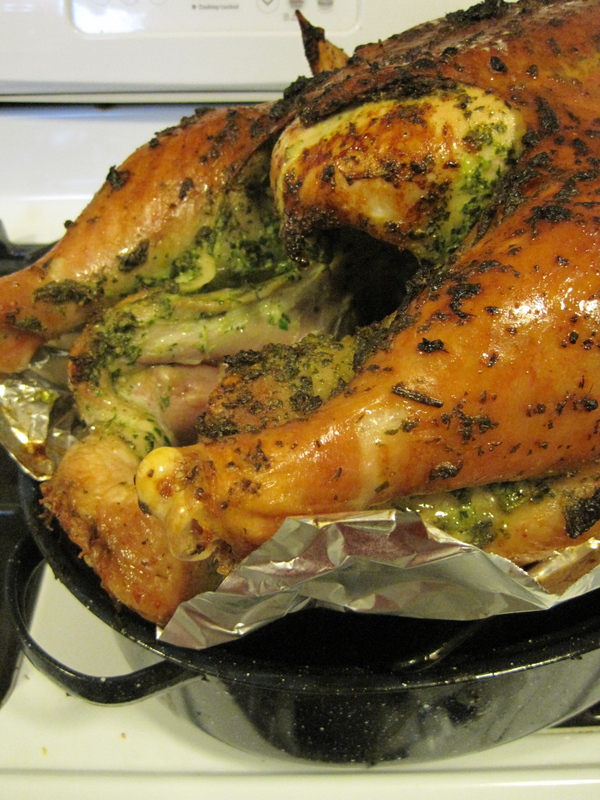 This year, I made Cook’s Illustrated‘s herb roast turkey. It appeared in the magazine a couple of years ago, and I see from my friend Google that it appeared on their TV program this year. The recipe is rather simple. I pulverized about two cups of mixed garden herbs — parsley, sage, rosemary and thyme — with Dijon mustard, garlic, shallot, and olive oil. The problem is that it’s incredibly messy to rub the herb paste under the skin of a slippery, unwieldy, wet bird. But manage it we did, and the miracle was all the more miraculous because it was the biggest turkey I had ever cooked: 22.5 lbs. of turkey goodness. Not sure if I’ll do that again, but it sure was pretty. The photo is of the turkey about an hour into the cooking process, just before we flipped it and turned the oven way down to finish the cooking. The bird was so large that it didn’t fit into my roasting pan — or any other pan — so we improvised a rack in a roaster with a cookie sheet underneath it. The drippings mostly dripped into the roaster…mostly. There was a small incident when oven floor met drippings, and smoke ensued, but we like to think that the smoked flavor just contributed something to the whole. The benefits of buying a bigger bird are really the fat content, I think. That sucker drained off about 6 cups of fat, and the roasted bird, with absolutely no basting and only a very little bit of oil in the herb paste, had a perfectly browned, crisp skin with just the mildest hint of grease crisping everything up and keeping the breast meat tender. Our slow, weak brine, as usual, yielded terrifically moist, slightly salty meat. As a hostess, I do wish my house was bigger and could more gracefully seat a large group. Is it too much to ask for a dining room table that seats 20 comfortably, haha? I am really, strongly pro-seated dinners, instead of asking people to perch their plates on their laps or inappropriate furniture, and even with all our tables and chairs and a massive table extended well past the dining room divide and into the living room, we still had a couple of people sitting on the couch. I’m also not a big fan of the dinner buffet (sorry, Mom), but we just didn’t have room to pass around dishes. When you see the menu below, you’ll understand why. Anyway…Retrogrouch urges me not to worry about these things, and it seems everyone left happy and sated, but I’m not sure what to do about next Thanksgiving. We might have a smaller group, or maybe stack people in bunk beds. I always brine. I know just by admitting this, I’m an anachronism in the food world, so yesterday. Even Cook’s Illustrated doesn’t brine anymore. 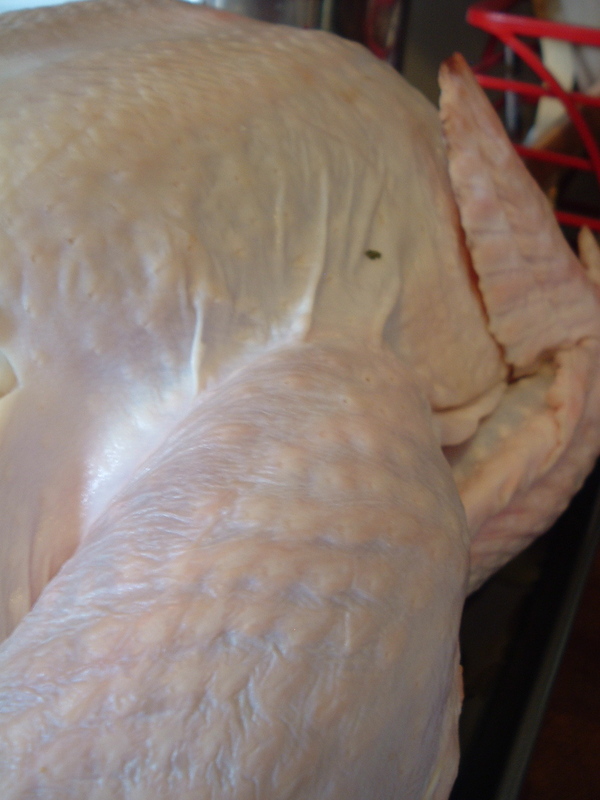 But I like the slightly slick juiciness that brining gives to white meat, and it’s never hurt my dark meat. Plus, it’s one slightly gross, slightly perverse aspect of Thanksgiving that Retrogrouch and I share. He’s not interested in too many aspects of cooking Thanksgiving. I tried to make a planning list. I said, what do we need to do for Thanksgiving? He looked at me as if I had lost my mind. “Stuffing. 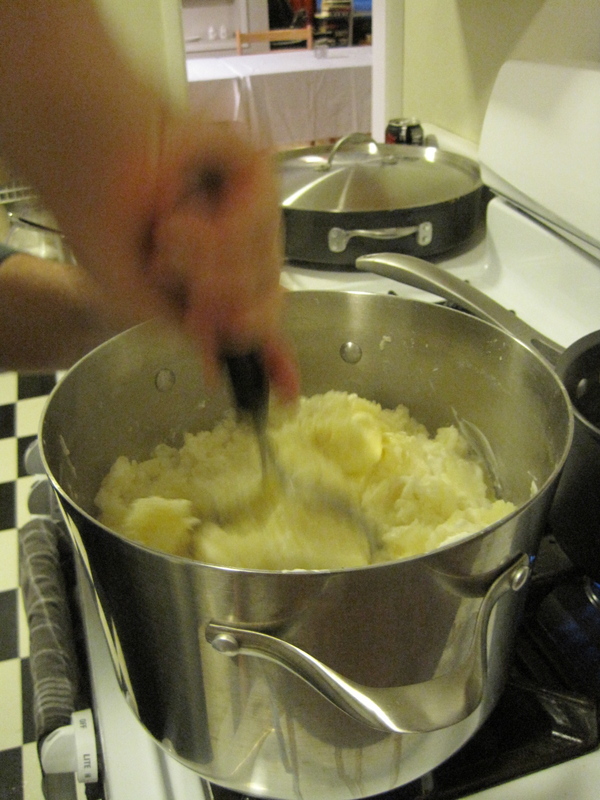 Mashed potatoes.” I said yes, of course, but what else? Each year we try to figure out a slightly less inconvenient way to haul the greasy, bloody carcass into a vessel that will hold it and not smell like revolting raw dead things afterward. It’s always a chore and an obsession to find, scrub, sterilize, KERPLUNK, brine, scrub, sterilize. Plus the feeling we’re doing something really wrong. Not to mention that smell on my hands. For the record, I do a simple brine: 1.75 cups kosher salt (or 1 cup regular salt, if I have it) to 2 gallons of water. 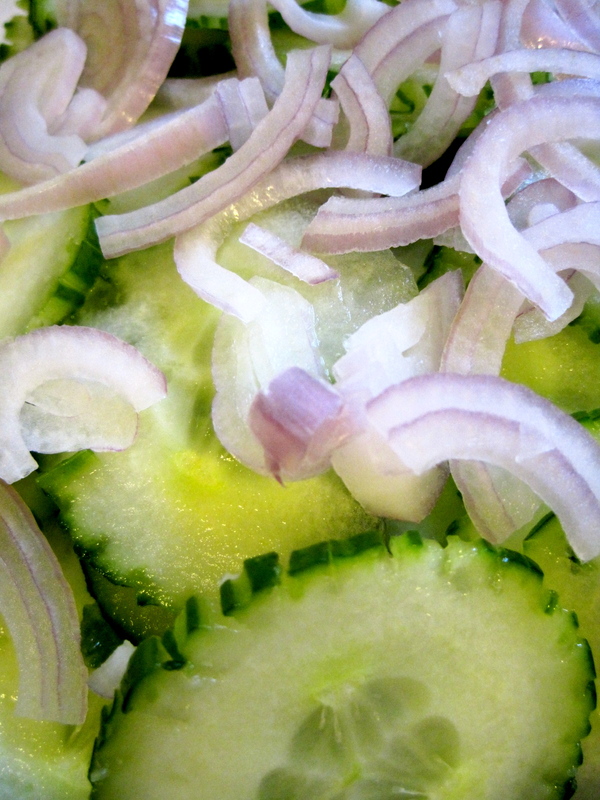 Keep in cold place like the refrigerator overnight, or for 8-12 hours. No sugar, no herbs, nothing fancy. A few years ago, I discovered my canning kettle was just the right size and relatively easy to clean. Plus, I boil it each time I use it. Handy, no? Well, the increasing size of our guest list, and corresponding increasing size of our turkey finally hit a crisis point this year, and I can’t find anything for the brining vessel. The canner was an utter failure, as you can see above. In fact, I’m so stymied, I’m just sitting here with a mess on the counter and bloodlust in my heart. 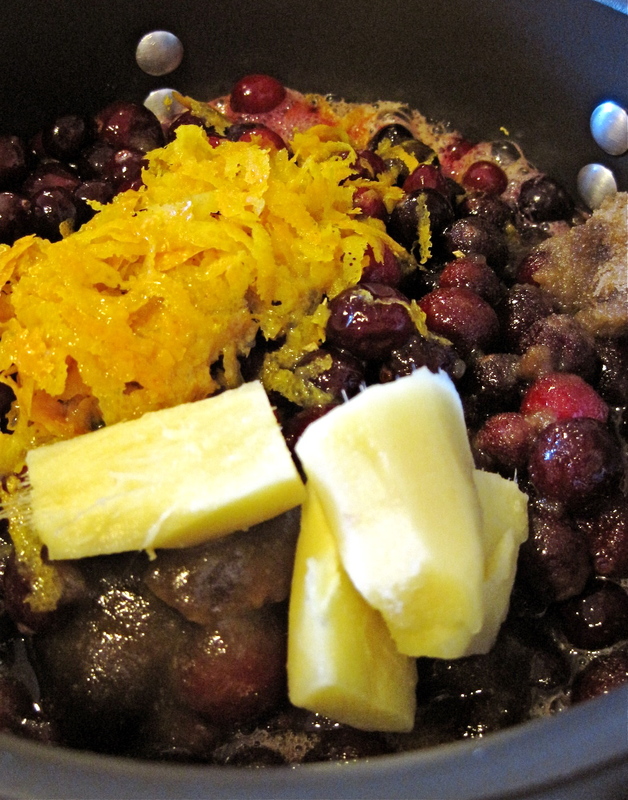 And since I’m on a blogging roll, I wanted to brag about my Punchy Cranberry Sauce again this year. Need a cranberry sauce recipe to wow your friends? You’ve come to the right place. Ginger Street and Northwest Orangezest, turn left at the bog. I’m amending the recipe this time to include less cinnamon, and adding star anise, more zest, and a hit of sugar plum syrup. But if you insist on checking out alternatives, there are some alternatives on this old Chow thread, too. I’m particularly interested in the pear-coffee-cranberry sauce, and the cranberry-onion-horseradish relish. Not that I’d switch teams or anything, but thought I’d throw ’em out there. There’s also this cranberry pie recipe from fellow Michigander blogger Kitchen Chick. The OSU Extension-Lane County Master Food Preservers are ready and waiting to answer your Thanksgiving food questions. Call in with your turkey, squash, stuffing, and cranberry queries the week before Thanksgiving. 541-682-4246, now until T-Day, M-Th, 9-4:00. A certified volunteer will provide all the information you need. Also, if you’re near the Fairgrounds this week, stop by the Extension Service building at 950 W. 13th, Eugene. Great, inexpensive holiday food gifts and stuff to bring to Thanksgiving parties. We have some plum juice from the King Estate plums available for purchase at the remarkable price of $2 a quart, mentioned in my previous post. We also have jams, sauces, relishes and chutneys left over from the tasting buffet fundraiser: $4 a half-pint and $10 for three. Some pie fillings are also available, if you’d like to take a homemade pie to your feast. Or just stock up on condiments for your leftovers. I’m particularly excited about fixing myself a turkey sandwich on Friday afternoon, slathering the bread with cranberry chutney or corn relish, mmmm..
Now that I’ve overseen my second annual “Holiday Gifts in a Jar” class for the Master Food Preservers, I’m in jar gift mode, and I thought I’d share the bounty of my research with you. Once a week, from now until New Year’s Day, I’ll be posting a recipe or link to something unusual and creative I’ve found that can be jarred up and offered to your loved ones as delicious holiday gifts. The class was a great deal of fun. We offered two sections, an afternoon and an evening, and had a range of demonstrations and hands-on workshops, including some crucial tips for decorating jars and baskets. There was a canning overview and workshop making (low) sugar plum jelly, a comparative analysis of chutneys and conserves, and creating layering of white powders for baking mixes in their regular and gluten-free forms. We also discussed safely making flavored oils (sun-dried tomato) and vinegars, and the class took home jars of blackberry and herb vinegar made with the remains of my 2009 herb garden and frozen chesterberries. There was a demonstration of making cranberry mustard from scratch by our local mustard experts, Jan Hurlow and Suzi Busler. I spent some time discussing local products that are particularly notable, and how to find them. Cindy Ambrose backed me up in the evening class by demonstrating how to make hazelnut brittle in the microwave. If you’re interested in making sugar plum jam, we have a few 1-Q jars of juice made from donated plums from King Estates winery left over from the class. We’re selling them at $2 a jar, a fantastic price for a high-quality, pure, unsweetened jar of juice. The quart holds slightly less than 4 cups of juice, which would work well for the following recipe that was featured in the class. 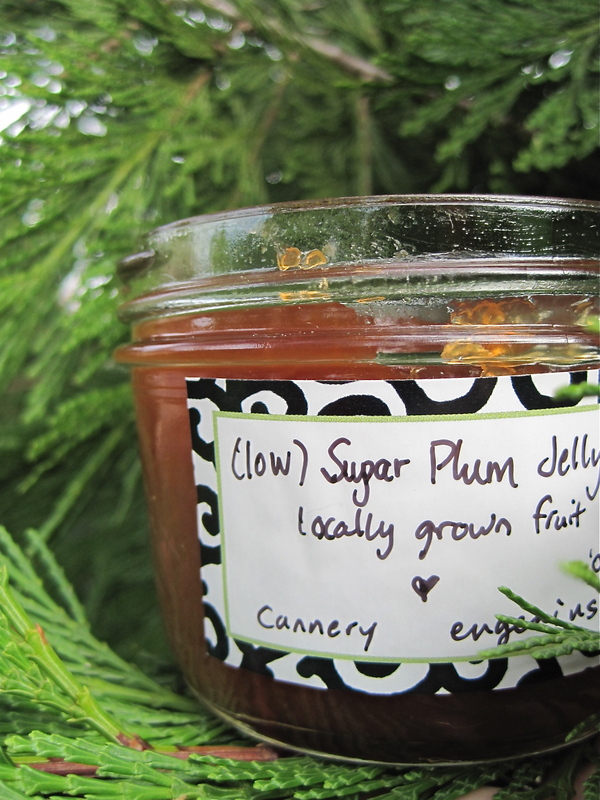 This jelly spread was adapted from my recipe for cider jelly. It uses spices that are traditional in making Victorian sugar plums. Makes 4 half-pints of low-sugar jelly using Pomona pectin. * Perfect for Christmas morning on cinnamon raisin bread, or mixed in with ricotta for a crepe filling. Macerate the spices in the juice at least several hours before canning. Measure out your juice and place in a jar or bowl that can be covered. Add cinnamon stick. Place the other spices in a little cheesecloth square that can be tied shut with string, then add to the juice. Refrigerate overnight, if possible. Before beginning your jelly, wash your jars and sterilize them by boiling them in your canner for 5 minutes. Wash your new lids and your rings. Keep the lids and rings in water at a simmer (180 degrees), don’t boil them, in a small pot on the stove. Filter out the spices from your juice and pour into a medium-sized pot. Add calcium water and lemon juice to juice in the medium pot on high heat. As juice is being brought to a rapid boil, mix together the pectin and the sugar in a small bowl. When the juice comes to a boil, add in the sugar/pectin mix, stirring constantly for one minute, to melt the pectin. If you don’t stir constantly, it will lump. Remove from heat. Skim foam that rises to the surface of the juice, if any. Fill hot jars, leaving a quarter-inch headspace, and add 1 t. per jar of the optional apricot liqueur. Wipe rims, cover with lids and rings, and process for five minutes in a boiling water canner. * If you live in Eugene, you can find Pomona pectin at Sundance, Market of Choice, and Down to Earth throughout the year. Do not substitute Pomona pectin for another brand of pectin, as they all process differently.